This steak tastes as good as it looks and smells. A tantalizing thrill for all the senses. Sautee shrimp in skillet over medium-low heat with garlic and oil until thoroughly cooked. Let cool. Remove tails from shrimp and cut into bite-size pieces. Combine pizza sauce and Alfredo together in small bowl. Spread evenly on crust, leaving 1" border around outer edge. 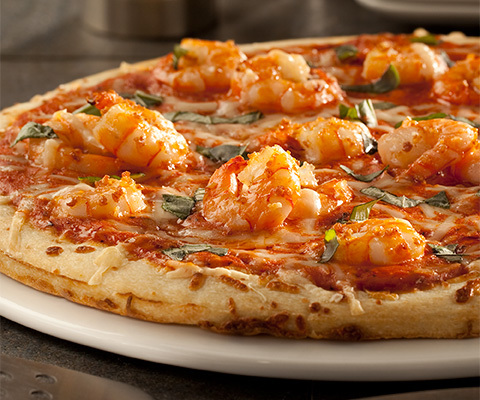 Top pizza with cooked shrimp, garlic, cheese and basil. For added zing, increase amount of cracked peppercorn to 2 tsp.If desired, substitute Classico Mushroom Alfredo Pasta Sauce with Classico Creamy Alfredo Pasta Sauce.